Welcome to Respiratory Therapy, the Journal of Pulmonary Technique. We’re bringing a new concept in presenting information to RT managers and supervisors, respiratory therapists, nurses, researchers and students. Our goal is to present a wide variety of papers in a clear, effective and familiar clinical format. Respiratory Therapy’s international clinical focus will ensure that our readers receive, with every issue, the latest and best information about all aspects of respiratory therapy as actively practiced in a wide variety of clinical venues and modalities. The scope of our features and departments includes original clinical studies from around the world, papers from RT caregivers working in a wide variety of locales and types of facilities, works in progress from respiratory therapists, researchers, and scientists, and informative studies about the latest products for RT caregivers worldwide. Special reports highlight RT management, legislative issues and the latest news, as well as practical technology updates and innovative approaches to respiratory therapy. A word about our covers: Why abstract art? We like color, we like energy. We don't want to look at pictures of chests or equipment. 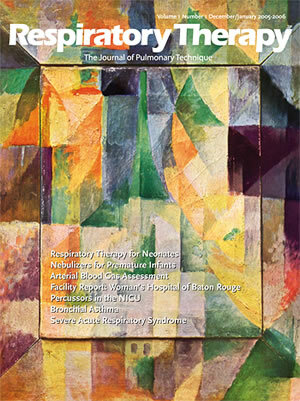 Furthermore, the art on our covers is meant to reflect Respiratory Therapy’s open approach to presenting information. Our art is like our journal: it is meant to be looked at with active curiosity, and offers a space for innovation. It doesn’t give pat answers; it asks leading questions. It is a generous, all-encompassing aesthetic. Its values are interpretive. That is, it requires active participation. It is non-judgmental. It is formally rigorous yet flexible. It does not misrepresent; it does not "stand for" yet it takes a stand. It is comprised of essentials. It does not deliver formulaic answers. It is inclusive and international. It is an education in perception. Our art is our philosophy. Respiratory Therapy: a breath of fresh air for RTs wordwide. All contents property of Goldstein & Associates, Inc.